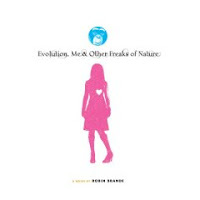 Evolution, Me & Other Freaks of Nature by Robin Brande. ARC from a friend. Publication date August 2007. Mena is starting high school; unfortunately, she had a falling out with her friends and is now a social outcast. Once more, I have the difficult task of saying "this book is the best ever" while not being able to give away too much, because I don't want to be all spoilery about a book that is not out yet. I will say that because of the sensitive way Brande balances a coming of age story with topical issues of religion and science, it's on my best books list for 2007. In someone else's hands, this could have been a "message book", where the message overwhelms the character and extinguishes the plot. This is NOT a Speak clone; the reason for Mena not being friends with her old group is both because of something Mena did -- something positive -- and also because that group? Not the nicest people in the world to begin with. Another good? Because that group had been Mena's friends for so long, she saw them as being the only kids in school. It's good that she's shaken up, and forced to start looking beyond the familiar faces from school, home, and church group. See, Mena's friends are from her church. What kind of church, you may ask? The kind where you cannot read Harry Potter or watch Lord of the Rings. The kind where, when the biology teacher says "Evolution", all her old friends turn their seats -- literally, turn their seats around -- and sit with their backs towards the teacher. And what Mena did has put her at outs with her church; a church her parents still attend. And let me share one of the best things about this book -- yes, some of the people in the church are hypocrites. But that does not destroy Mena's faith. Between the evolution and the exclusion, this could easily have been a "and then a teen discovers its best to have no faith, no religion, no god" type of books. Instead, Mena does not allow these individuals to shake her own faith, and her belief in and need for religion. What is even better about this book is that it is not evangelical; it's about Mena's journey, about her own coming of age, and there are no "are you saved" moments directed towards anyone, including Mena, other characters, or the reader. When Mena's friends start the evolution protest, she has to think for the first time about the choices in her life. If "the break" hadn't happened, would she be turning her chair? And now that she isn't in that group, and she listens to her teacher and students, what does she learn? Is evolution really anti-religion? Can a person believe in religion and also love science? Other things I like: Mena putting her life together. Her cute lab partner, Casey, a guy -- who introduces her to the joy of The Lord of the Rings. And is also a love interest. And despite everything -- Mena is at heart a good kid. She loves her parents. She's torn up that she's hurt them by the thing that happened over the summer. But she wants to make the right choices; and she's learning that doing the easy thing and doing the right thing are very different. Which means she has to learn how to be strong. Another interesting plot involves the Internet. No, not just a kid who texts and blogs; rather, this looks at the online community and how being involved in that virtual world can give quiet people a voice, connect individuals to those outside their small town, and be a positive experience. In the way that it sometimes works with books, shortly after finishing this I read Saxons, Vikings And Celts: The Genetic Roots of Britain and Ireland by Bryan Sykes. And while I skimmed a lot of the science part, the evolution of DNA was extremely interesting, and timely; since part of the school protest in the book is based on the argument that "evolution is just a theory so shouldn't be taught". BibleGrrrl, a website tie-in for the book. Includes links to the first chapters of the book.